T P M S M T D F e b r u a r y 2 0 1 9 52 NOTE: e Signal Tech II Tool (J-50190) can be used to perform the following: • Activate the TPMS transmitters. 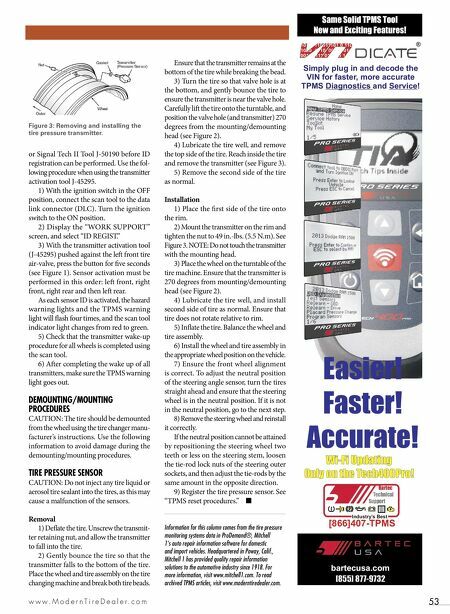 • Display the TPMS transmitter IDs. • Display the tire pressure reported by the TPMS transmitter. 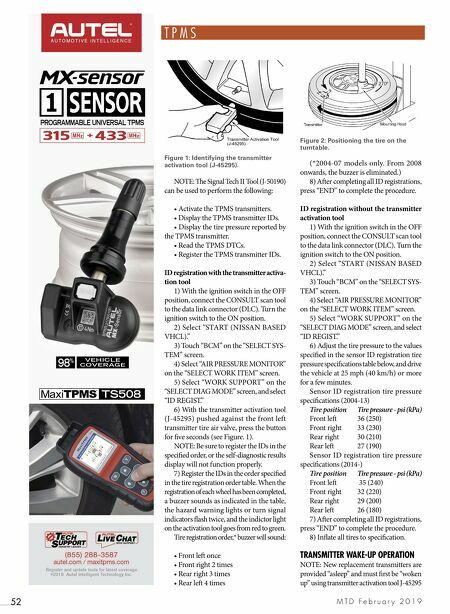 • Read the TPMS DTCs. • Register the TPMS transmitter IDs. ID registration with the transmitter activa - tion tool 1) With the ignition switch in the OFF position, connect the CONSULT scan tool to the data link connector (DLC). Turn the ignition switch to the ON position. 2) Select "START (NISSAN BASED VHCL)." 3) Touch "BCM" on the "SELECT SYS- TEM" screen. 4) Select "AIR PRESSURE MONITOR" on the "SELECT WORK ITEM" screen. 5) Select "WORK SUPPORT" on the "SELECT DIAG MODE" screen, and select "ID REGIST." 6) With the transmitter activation tool (J-45295) pushed against the front left transmitter tire air valve, press the button for five seconds (see Figure. 1). NOTE: Be sure to register the IDs in the specified order, or the self-diagnostic results display will not function properly. 7) Register the IDs in the order specified in the tire registration order table. When the registration of each wheel has been completed, a buzzer sounds as indicated in the table, the hazard warning lights or turn signal indicators flash twice, and the indictor light on the activation tool goes from red to green. Tire registration order,* buzzer will sound: • Front le once • Front right 2 times • Rear right 3 times • Rear le 4 times (*2004-07 models only. From 2008 onwards, the buzzer is eliminated.) 8) Aer completing all ID registrations, press "END" to complete the procedure. ID registration without the transmitter activation tool 1) With the ignition switch in the OFF position, connect the CONSULT scan tool to the data link connector (DLC). Turn the ignition switch to the ON position. 2) Select "START (NISSAN BASED VHCL)." 3) Touch "BCM" on the "SELECT SYS- TEM" screen. 4) Select "AIR PRESSURE MONITOR" on the "SELECT WORK ITEM" screen. 5) Select "WORK SUPPORT" on the "SELECT DIAG MODE" screen, and select "ID REGIST." 6) Adjust the tire pressure to the values specified in the sensor ID registration tire pressure specifications table below, and drive the vehicle at 25 mph (40 km/h) or more for a few minutes. Sensor ID registration tire pressure specifications (2004-13) Tire position Tire pressure - psi (kPa) Front le 36 (250) Front right 33 (230) Rear right 30 (210) Rear le 27 (190) Sensor ID registration tire pressure specifications (2014-) Tire position Tire pressure - psi (kPa) Front le 35 (240) Front right 32 (220) Rear right 29 (200) Rear le 26 (180) 7) Aer completing all ID registrations, press "END" to complete the procedure. 8) Inflate all tires to specification. TRANSMITTER WAKE-UP OPERATION NOTE: New replacement transmitters are provided "asleep" and must first be "woken up" using transmitter activation tool J-45295 Figure 2: Positioning the tire on the turntable. Figure 1: Identifying the transmitter activation tool (J-45295).